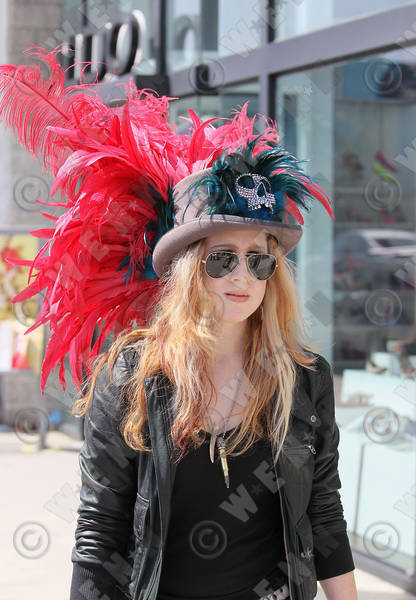 New music artist Erica Chase was either attacked by a large pink bird or she sported the best rock and roll Easter bonnet in Hollywood as she walked out of Flasher on Melrose Ave. in Los Angeles and was spotted on the street by two paparazzi photographers. If it's a bird, somebody call an animal rescue. It's an Easter bonnet, then Fergie's daughters and the other British ladies who don those crazy hats have nothing on Erica. When Erica isn't shopping for killer rock threads, she and her Sheryl Crow-Meets-The-Beatles vibe are working on her upcoming album with multi-platinum producer Dana Strum of Slaughter. You may also want to check out our previous fashion article Rocker Chic(k) Erica Chase Trendy on the Red Carpet.